182. As mentioned before, the Apostle Paul was just full of retroactive scriptural analyses to support his own wacky political points. This argument’s a classic, drawing on the Old Testament text of Hosea – you can find it in Romans 9:25 and forward. The original group of Jesus’ disciples – who knew Jesus personally, unlike latecomer Paul – seem to have thought of themselves as a radical sect of Jews, a sect that was more open to interaction with people of non-Jewish ethnicity, that de-emphasized the observance of kosher law, shunned traditional paths to power (temple, commerce) and material concerns in general, and maintained a strong belief that the end of the world was nigh and something exciting existed thereafter for enlightened Jews. Unshockingly, this produced little enthusiasm from the group of Jesus’ original disciples and a great deal of (further) indifference from much of the mainstream Jewish population. So here’s Paul’s conundrum: how do you explain the fact that God’s own chosen people on the whole seem to be repulsed by what (in his opinion) is clearly Yahweh’s biggest brainwave in millennia? Why, through a lot of quick footwork and scriptural reinterpretation, that’s how. 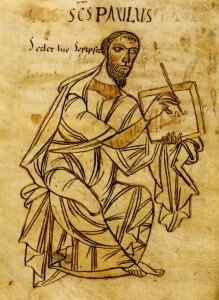 In this letter to some of his hardwon adherents, Paul dredges up the Old Testament story Luther here is citing. The original story in Hosea is a metaphor about the wandering eye of the Israelites – Hosea is a man whom God commands to marry Gomer, a notoriously loose woman. As the metaphor unspools, we learn that the Israelites, freed from Egypt and safely out of the desert thanks to Yahweh, subsequently show their ingratitude by observing rites for the local Babylonian fertility gods. Yahweh storms out in a huff and disowns his chosen people, cursing their fickleness. He knows, however, that it’s only a matter of time before the Israelites come begging for forgiveness, and once they show the proper penitence he’ll welcome them back. Whence “I will call them my people who were not my people” – they aren’t actually new people; they’re just his old people becoming his people again. Oh, and incidentally, those “people who were not my people” is no longer a reference to the de-chosen becoming re-chosen. It’s a reference to people who never WERE God’s people…until now. Now that’s ballsy. This is far from Paul’s biggest reach. Trying running an internet search for “Abraham’s seed” and you’ll see what I mean. I love the guy; when else has a manic freelance tent-maker completely altered the course of Western civilization? And, stepping away from Paul: you might recognize the envelope that’s in front of Lucien in panel 3, as well. 184. And that answers the question about who died. The bottom panel on this page confused the hell out of everybody when it first went up and there was no context for what this crowd is doing. Understandably. College boys have been doing inexplicable things for a long time. “Shameless Platonist” – not previously mentioned because it’s unimportant: Lucien’s academic focus is on the Greek philosopher Plato and his inheritors (including Aristotle). I suppose technically Lucien is a Catholic, but I doubt he’s been anywhere holier than a lecture hall in a long time. Plato is the first Western philosopher from whom we have substantial writings, and the old saw is that all Western philosophical thought since has been nothing but increasingly abstract reactions to his thinking. For entertainment’s sake, I will note that Plato was a firm believer that the material world is a thin, drab veil over an invisible world of ideal and eternal forms. While Spinoza does state that thought is on a different slice of reality from bodily activity, no “slice” is more real than any other; they’re all extensions of the one existence, one big sandwich of being. So you can imagine that Lucien and Luther had had some good arguments in that carriage ride. At any rate, Plato is more fun to read than most of Spinoza. Symposium is set at a drunken house party which is at one point crashed by hookers. 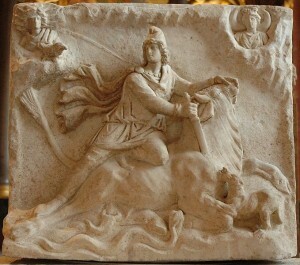 “Cult of Mithras” – the Mithraic cult is generally brought up these days for its many superficial symbological similarities to early Christianity. It was a fairly big deal in sections of the Roman empire at exactly the same time Christianity was just getting off the ground. Followers of Mithras enjoyed lots of complicated top-secret rituals and obscure rankings. There were plenty of religions and minor cults in the ancient world that involved a lot of mysterious doings, and they remain largely mysterious today. “Athenian Academy” – the philosophy school founded by Plato in Athens around 590 BCE, a groundbreaking and exclusive institution that mixed features of what we’d call a university with what we’d think of as a social club. There were also a lot of secret doings and ritual observances at the academy. …Of course, so many rituals held amongst men in secret ultimately involve getting drunk and humiliating somebody. When last I checked in with it, it was hanging in the Musee D’Orsay in Paris, and all the other paintings in the room were palpably embarassed. The docent’s comment on the piece was “Here at the Musee D’Orsay, we do have some bad art, but we have only the finest bad art.” Bravo. 187. That is an example your plain old barn owl, which you can find on just about every continent. Yes, and in Harry Potter, I know. And Heidelberg is host to another one of the most famous universities in German-speaking territory. It was the site of a great amount of fuss during the 17th century Reformation, but it had calmed down a little by Luther’s time. 189. …Those secret rituals also tend to involve getting naked. But that comes after the drinking. Studiomates got on my case about how few of the young faculty members appear to be in any kind of shape. But these are nerds, people. 18th century sedentary nerds. Who eat nothing but Czech and German cafeteria food. It’s amazing they can still walk unaided. And yes, Lucien is making a joke about circumcision. But it suggests there’s something he can’t perceive, eh?